FREE Tri-Coastal 14-Piece Nail Polish Set! You are here: Home / Great Deals / Christmas Deals / FREE Tri-Coastal 14-Piece Nail Polish Set! Sears has this Tri-Coastal 14-Piece Nail Polish Set on sale for $9.98 and you can get back $10.08 in Shop Your Way points, making it FREE! Keep your fingers and toes perfectly polished with a little help from the Tri-Costal 14-Piece Nail Polish Set. 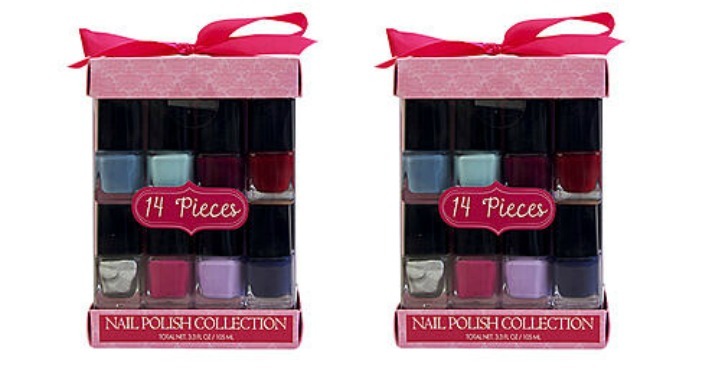 Packaged in a cute box complete with pink bow, this set contains 14 different colors of nail polish. Reds, blues, purples and pinks, all your favorite colors are in one spot with this sweet set of nail polish.